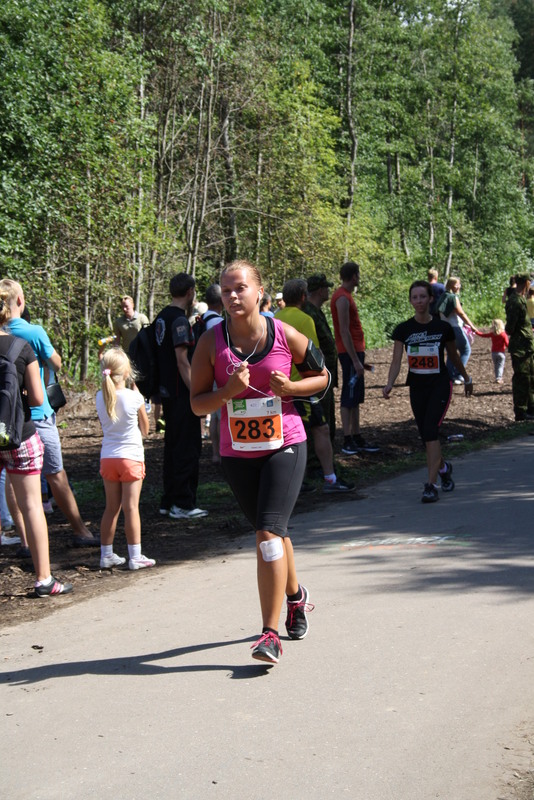 Narva Energy Run 2013 was my first ever sports competition. I was never the person to do sports, not even to talk about paying to do sports or pay to compete. 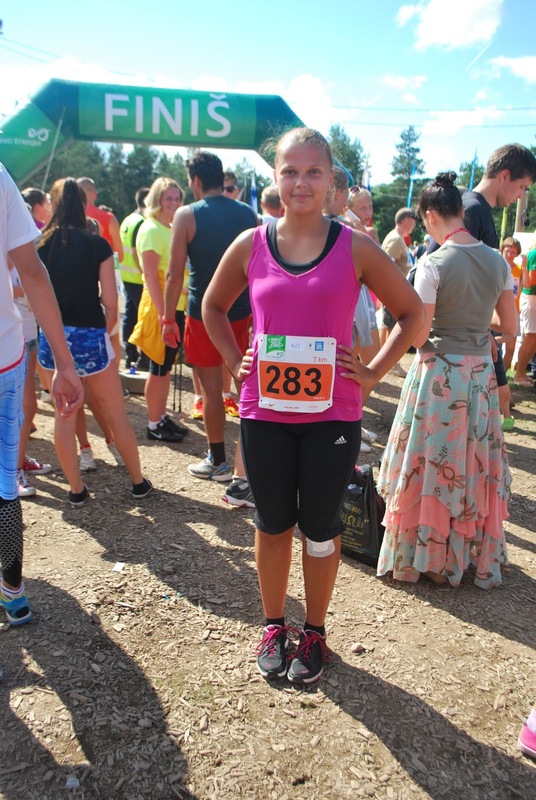 But last Saturday I was competing against about a thousand runners (plus another thousand who didn’t have their time measured) on the 7K distance in Narva Energy Run. As many of you might know if you follow my Workout Week posts, I really didn’t have specific plan for the 7K since I run that about twice a week anyway and do other sports 3 times a week. If I was running half-marathon, I wouldn’t go without a plan but this wasn’t that big. And it was my first race so I didn’t have any expectations really. You can read about what I ate the day before here. The evening before the race I had a sharp flash of sciatic pain in my buttock once. That made me even more nervous. On Saturday I got up at 8 AM. Washed, got dressed and then decided to take a regular 30 minute walk with my dog. The weather was nice, normal temperature and no rain. We were about half way done with our walk when I decided to make a few running steps. We have done that a million times before. But this time something went wrong. After about 10 metres of jogging with my dog, somehow I found myself on the tarmac. The more I started to fall, the more the dog started to pull me and I was on the ground. My wrist, elbow and knee were bleeding. I just couldn’t believe that. “How do those things happen to me?”, I could only think. Knee patch on, ready to go. Not really. I was so angry with myself. Why did I have to jog?! Why? I started crying (I don’t cry like ever) and was really upset. My knee and elbow hurt, my knee was really bad. I walked home but was still really upset that my first race experience was ruined. I cleaned my wounds and found something to cover them with. They hurt. I was upset. My family started running around crazy and I was even more upset. I tried to be calm again. Had some water and breakfast (some LCHF cheesecake). Then we had to hit the road to Narva. My mom, dad and brother and then… a miserable me. We picked up my friend from Jõhvi. Pretty much the first thing she asked me was why I was so sad. I only showed her my elbow and started crying. I still only thought that my first race is ruined. Ruined. We reached Narva about 10.45 AM. Parked the car, saw the start of the half marathon, got our numbers and other stuff and gave away my backpack. There was plenty of time so we walked around and also got a body analysis for free. The results were a little off, though. I’m going to get that analysis again in September. So 45 minutes after noon there was a little warm up, I met some old acquaintances and then it was already 1 PM and start time. I didn’t rush, just did what I normally do on my 7K runs. The weather was HOT. And the sun was shining. I wished it was a little cooler, that would have helped a lot. The people were nice though and it was a new experience to run with 2000 other people. 5K was the drinking point. I got a little water and kept going. Then a small insect got to my eye. Fortunately I got it out and that didn’t cause any other troubles for me. I felt my knee patch coming off, the wrist patch was already off and the elbow patch was long gone. Before the 6K point a car wanted to join our running lane. Didn’t get hit. Considering the whole day, that was an accomplishment. Already the finish line approached. Last little climb uphill. Last 100 metres. I sprinted to the finish line! People cheered. I did it. Happy. Got a sportsdrink. Then I looked at the label: almost 6 grams of carbs per 100 grams. So the bottle was more than my daily norm. Thanks, but no thanks. Got my own water from my backpack and did some stretches. My knee patch was almost off so I got a new one from the medics. But my skin was sweaty so it started coming off almost immediately. Then I saw my family reach the finish line. The race was over. We took some pictures, my mom took photos of the rewarding ceremony and we started moving back to our car. By 4 PM we were home. Overall it was a good race. I got my best speed which is the most important, I won myself, I outdid myself. But I am not happy, I’m still… disappointed. Somehow I didn’t get this amazing “I-want-to-do-it-again!” feeling and was sad when I saw the positions and everything. I was just sad. The falling and hurting myself in the morning had a lot to do with that, I think. When will be my next race, I don’t know. 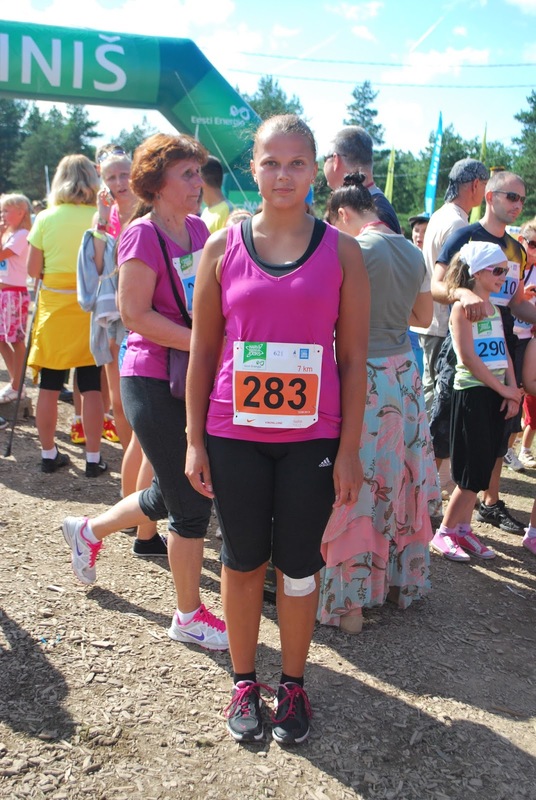 But I hope someday I will overcome this bad feeling inside me that I still have now after my first race. I feel like a poor jogger not a runner anymore. Will someone make that feeling go away, please? Kui aga rekordid tulevad, siis ju arengut on. 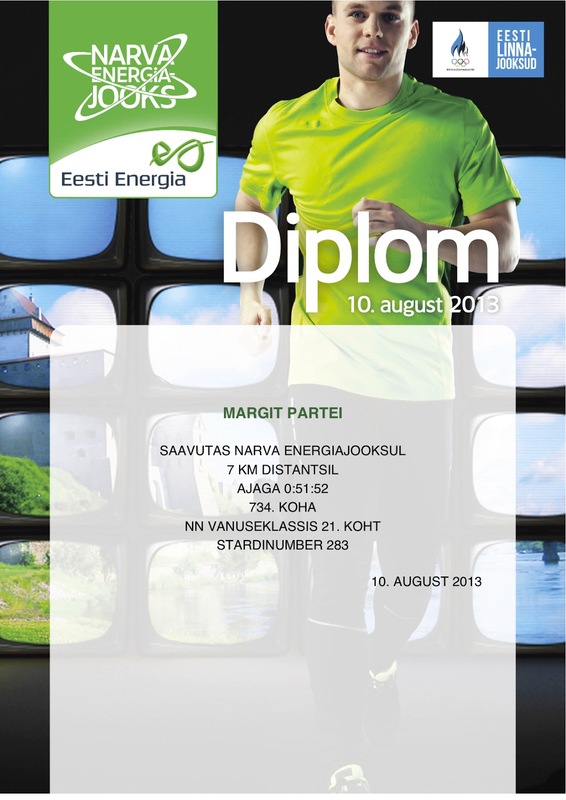 Ma isegi pusisin nii aastake enne kui veidigi kiirust ja võhma tekkis, aga ilma järjekindluseta ei juhtu siin mitte midagi. Anna omale aega. Ise olen nii 5 aastat järjepidevas liikumises olnud ning nüüd saan pea suvalise vahemaa jookstud küll ja -20kg on kehakaalust läinud.